Mike and Liz Hairpieces has built up an excellent reputation over the past 50 years. Mike and Liz Hairpieces has an on-site factory to model your styles exactly to your specifications. Our staff look forward to providing you with exemplary service and quality workmanship, as our family has done for four generations. 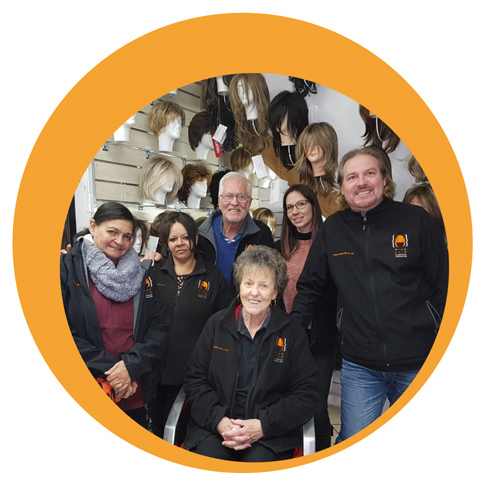 Our factory staff considers each client’s individual needs by offering additional colours and highlights, as well as alterations, resizing and repairs to all wigs and hairpieces. Our holistic approach will assist you every step of the way. We work along-side support groups such as “Wings of Hope”. We will consult with your hairdresser and other beauty professionals to provide you with a full solution. Mike and Liz Hairpieces offers cutting, washing, styling, and product care support. Our extensive range includes synthetic and human hair products. You also have the option of blending in your own hair. Enjoy the benefit of our tranquil home setting and safe and secure parking. Your children can enjoy our beautiful garden as well as some extra activities during your consultation. Our hire section has a huge range of different types of wigs. We have an on-site factory where we have two qualified technicians who are always ready to assist you in personalising your wig to your perfection. Mike and Liz Hairpieces established in South Africa. Company taken over by Mike Dashwood from his mother Freda Dashwood. Jon Renau was introduced to Mike and Liz Hairpieces - ever since then we have built a strong foundation with the Jon Renau family and team. We became suppliers of the popular brand Rene of Paris/Revlon. We introduced the stunning Noriko range by Rene of Paris to our list of wonderful brands. Amore by Rene of Paris was a huge hit and one of our best selling brands. Mike and Liz expanded due to high demand. Our premises were renovated and made more comfortable for our clients. South Africa hosted the 2010 World Cup. We had a huge demand for hired wigs. Our beautiful hire section was expanded. We now carry a wide range of wigs that we hire out. Mike and Liz had a huge demand to make personalised products for different productions and theatres, our factory was operating full force and in high demand. Mike and Liz Hairpieces has formed a milestone building strong and professional relationships both with our suppliers and our customers, always ensuring our clients are comfortable and satisfied with our services rendered and our various brands and products on offer. Mike and Liz are proud to have been in business for 50 YEARS in 2018. Offering hair services to the public and growing stronger as a team. My grandfather, Willem Paardenkooper, born in Holland in 1878, was naturalised in England. Just before the first World War he married a young English girl and continued his practice of wig making and hairdressing in London where he was well-known and had the Royal insignia in his salon. The couple had three children, my two uncles and my mother. They carried on the hairdressing tradition and my mother helped me tremendously once I had qualified as a hairdresser in building up the wig and hairpiece practice. Elizabeth May and I married in 1970 and had two children, Delia and Logan. At that early stage of our business we travelled the length and breadth of South Africa, calling on hair stylists and supplying hairpieces and related products. At that time mainly assorted hairpieces were sold. (For anyone who has just had human hair extensions fitted I would pay three pounds for a kilogram of double drawn 20” hair, which today would cost in excess of R30,000 to R40,000).